If you were a kid with little to no access to money, what would you do to raise money to help your family? How creative do you think you would become? 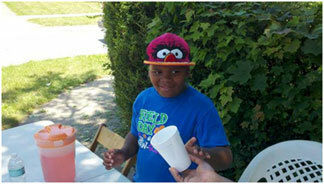 An Ohio boy who wanted to help pay for his grandmother’s funeral, put up a kool-aid stand to raise money for the cause. “I am raising money for my grandmother’s funeral,” said 8-year-old Michael Diamond. Diamond’s grandmother, 52-year-old Bobbie Diamond, died on Father’s Day after a long battle with cancer. The funeral costs $5,000 and Michael wants to use whatever money he makes at his kool-aid stand to offset that cost for his family. Michael says his kool-aid stand has been welcomed by neighbors and passersby alike. The 8-year-old spends long days at the kool-aid stand, during which time he says he daydreams about what he would say to his grandmother if he still had the chance. “I would tell her I love her, and I hope to see her again” says Michael. So far, Michael has raised $173 and it’s only his third day on the job. He sells large drinks for $1.00 and small drinks for .50 cents. Michael says he’s going to keep the stand going until Sunday, June 23rd. If you’re in the Ohio area, Michael’s stand is on 4806 Rockwood Road in Garfield Heights.